Three weeks ago I shared the post A New Re-Decorating Project where I discussed how my husband and I are going to re-decorate a guest room in our home. 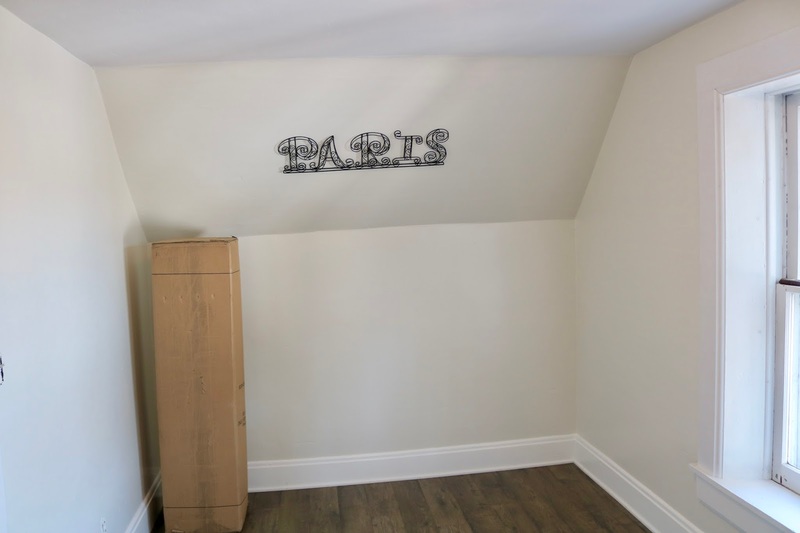 I showed both "before" pictures of the room and inspirational pictures from Pinterest that show the look I'm going for with this guest room re-design. This week, I'm going to show you the progress we've made so far. First, everything was taken out of the room except for a few boxes so I could paint. This was the wall color "before". A very deep red. This is what the walls looked like after only one coat of primer. I ended up painting two coats of primer and two coats of paint to cover the deep red. Jackson sat on top of the mattress in the hallway to make sure I got everything just right! When choosing a paint color, I wanted something that was "white" that would stand out from the white trim. I thought this "China White" did the job beautifully!. 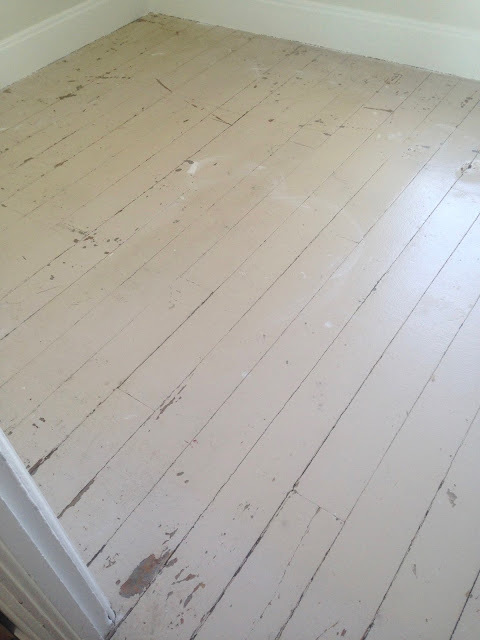 The floor in this room was just painted sub-floor. The paint was all chipping off and there were a lot of dents and scratches. A space rug previously covered this floor. After I painted the walls a "China White", hubby laid a plywood sub-floor over the old sub-floor to make it stronger and more level for the new laminate flooring that will be installed. The "China White" walls turned out beautifully. The room is so much lighter and brighter now. I love the way the "Paris" sign really stands out now. The "China White" color provides a nice contrast against the pure white ceiling and moldings. And if your wondering what the tall box is in the corner, it's a new mattress. We are trying one of those 'Gel Memory Foam" mattresses that are all the rage right now. We'll let you know what we think when the room is all done! 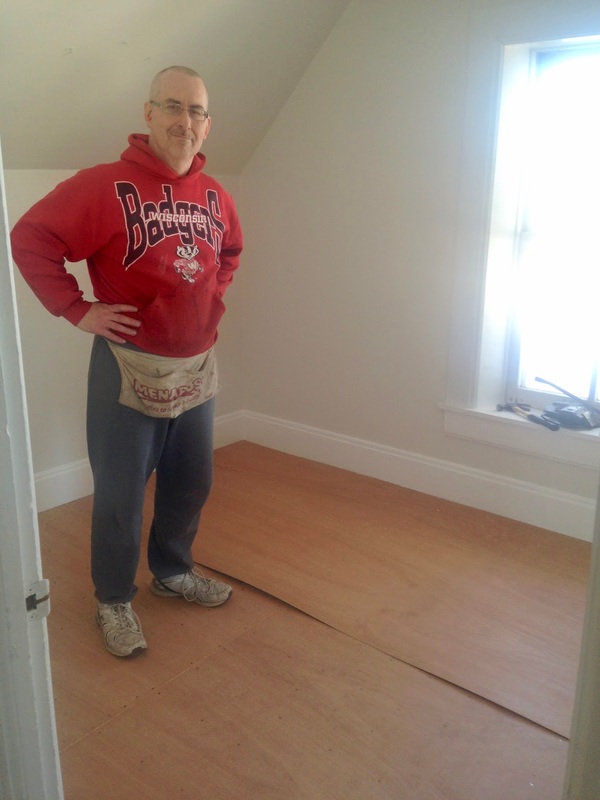 We put in the same flooring that we installed last year in our Master Bedroom and hallway. 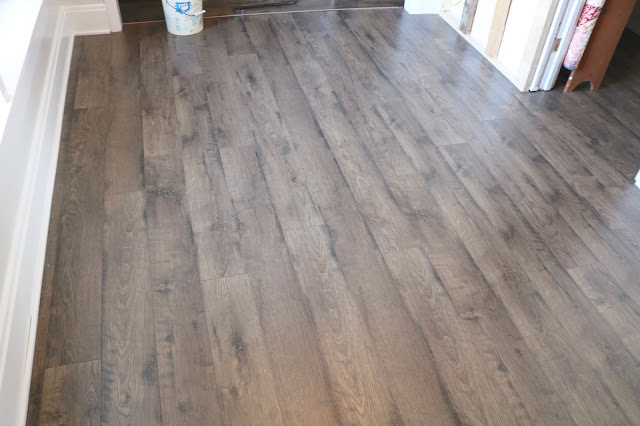 It's called "Grey Stone Oak" laminate flooring by Mohawk. It looks wonderful with the "China White" paint, and the entire upstairs feels more spacious now that the floor is the same in the two bedrooms across from each other and the hallway. 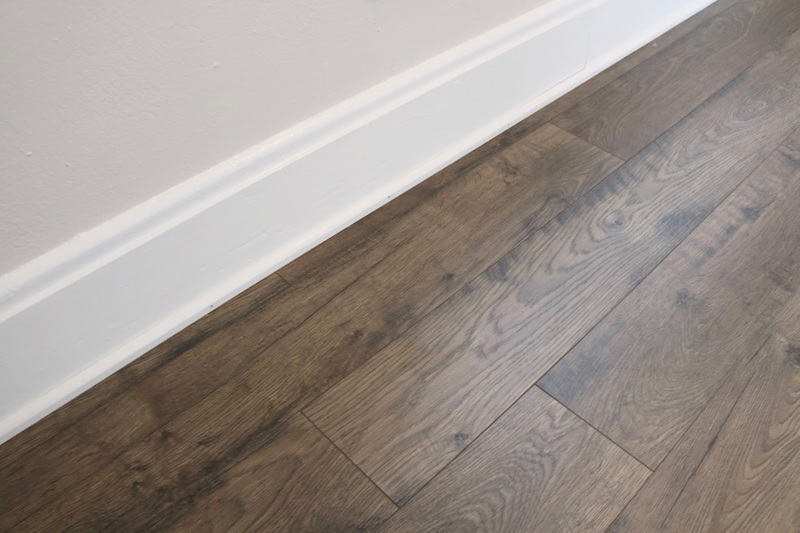 The floor, the "China White" paint, and the ultra white trim all go beautifully together. I couldn't be more pleased. Now that the painting was done and the floor was completed, it was time to put in a new pocket door. The room previously had a normal door that swung into the room. Because this room is going to be used as a guest room, we need to fit at least a full-size mattress in this room. But the room is so small, that the door hits the end of the bed unless the mattress is put up against the wall. We want the bed to be accessible from both sides, so in order to be able to turn the mattress we had to put in a pocket door. Using the old door, my husband rigged up a system to make a sliding pocket door. There is a short video at the end of this post where he explains how he did it in further detail. The wood beams you see will be covered up by drywall. 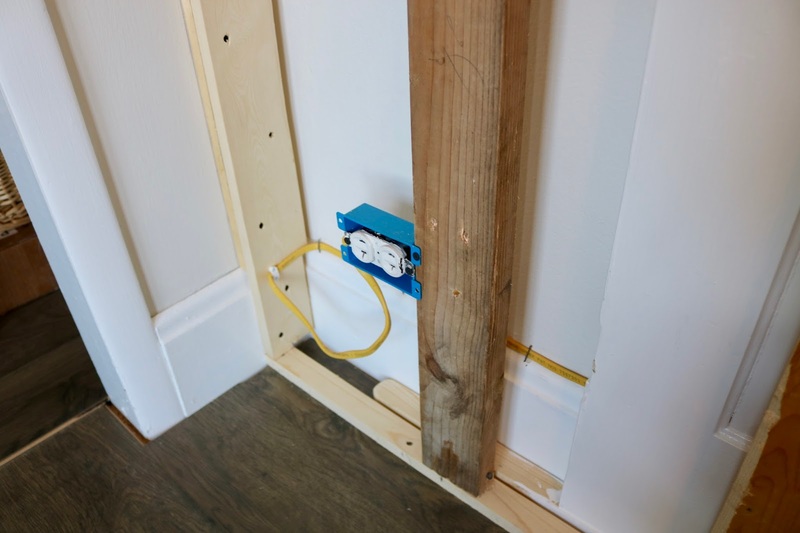 I photographed it without the drywall so you could see how it works. Basically a wall is built in front of the old wall that the door slides behind. 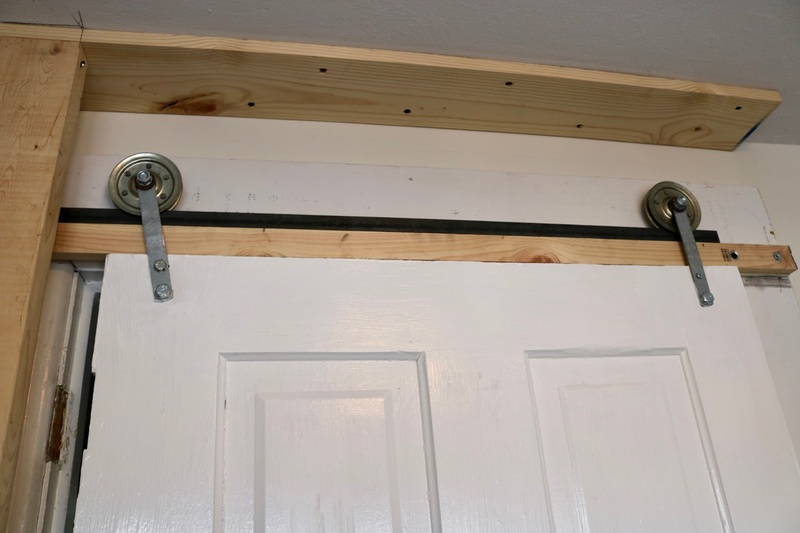 The door slides nicely across the wall using a system of angle iron, garage door pulleys, U-Brackets (hammered flat) and bolts. There was a outlet on the wall that we didn't want to cover up, so my husband pulled the outlet forward. He then added a piece of wood to the bottom of the door that has a unique stop. If you look closely at the bottom left of the photo, there is a small notch on the bottom of the left light wood beam. 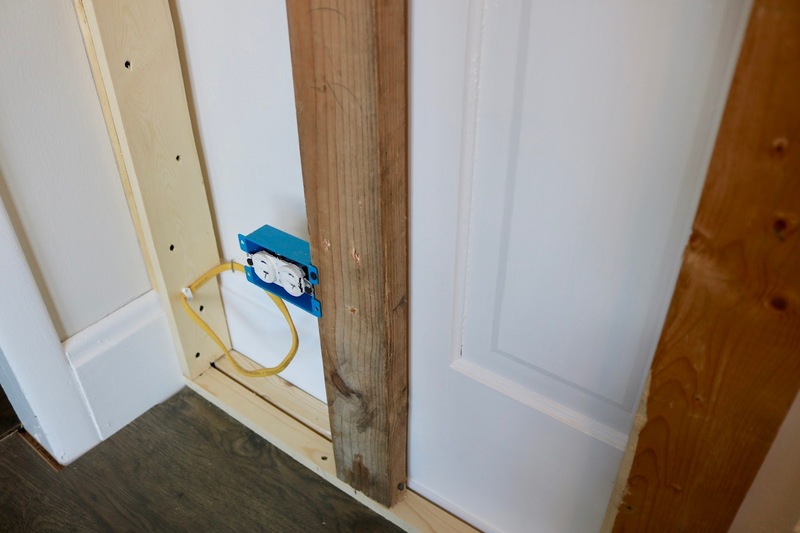 The piece of wood attached to the bottom of the door, will fit neatly inside the notch when the door is fully opened. Here the door is fully opened and tucked behind the wall. The piece of wood is now snug under the beam. In my next post, I will show the pocket door wall when it is completely finished off. 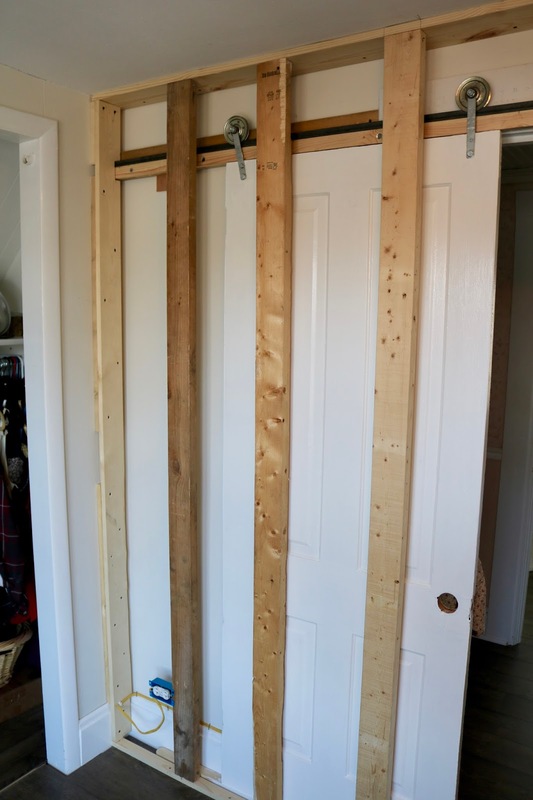 And finally, my husband did a short video illustrating how he constructed his pocket door. The worst part of re-decorating is always the painting and construction part. I can't wait till that part is over so I can get to the fun part: DECORATING! I did a lot of shopping for the new guest room when I was in Illinois last week, but I still have a lot of things to find. We ordered a headboard, but my husband will be making the bed that the mattress sits on. I need this room for storage, so he had to build a bed to allow for me to fit totes underneath. Hopefully in my next post I'll at least be able to show you the finished wall and bed! To say I'm excited about your new project is a huge understatement! I love the paint transformation. I love the workaround with the door so that you can now better-position the bed. I love the flooring and its seamlessness with the other rooms. I love hubby's skill and ideas. And I love that Jackson is supervising the project! I'm hungry for more. Hugs, x. Thank you! You sound more excited that I am and I am pretty excited! I'm very grateful to have a handy husband. If we had to pay a contractor to do this stuff, I couldn't even imagine the extra expense! I love the white walls, they do brighten up small rooms so much! 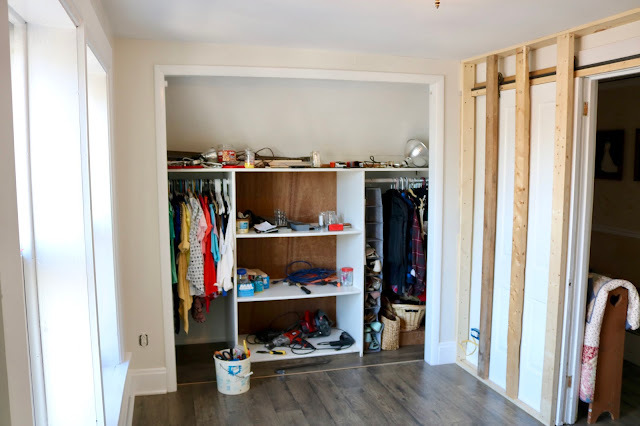 Your husband makes it look so easy to make a sliding door. He's doing a fantastic job! Thanks Ellie! I need to stop watching HGTV. They're the ones who advised me to paint the room a dark color in the first place! Haha! Always go with what you like and don't follow trends...you'll be happier in the end! I'll let hubby know what you said. It's great to be married to such a skilled carpenter. Great progress. The flooring is gorgeous! Thanks Cathy! We need the encouragement as redecorating is a lot of work! I hate the clutter and mess in the rest of the house too! This room is going to be beautiful when completed! I can hardly wait to see it. I love the floor. Thanks Helen! I have my husband to thank for the floor. I originally wanted to carpet it, but he insisted on the laminate. He was so right, because the flow upstairs is so much nicer now! What an awesome project. 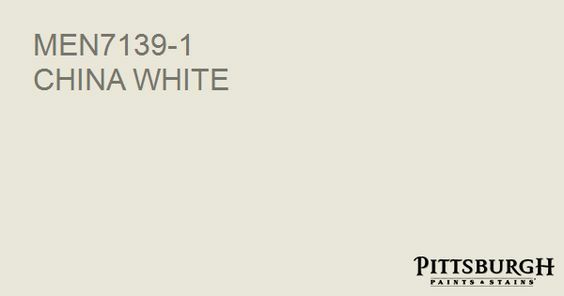 I love the paint color (China White). Gotta remember that and the new flooring. Not to mention how I am drooling over your pocket door. I know it is going t be absolutely goretous!!! Thank you! I think I will paint my living room that color too! What a difference!! Everything looks so fresh and the room looks larger! Your Hubby did a great job. Thanks Marisa! He's a great carpenter! Beautiful job. I love doing projects like this also. I just did a makeover of my grandkid's toyroom last week. Thanks Pamela! Did you post a picture of the toy room make over anywhere? I'd love to see it! Thanks so much Dee! We were originally going to do one of those new, trendy "barn doors" but decided we'd rather have the door hidden and have the wall space. Especially in such a small room. Oh I know! I wish I would repainted it years ago! I'm slowly going through my entire house repainting everything a lighter color. Love your floor! What a great project, can't wait to see more! Thanks Nancy! I'm thrilled with the floor too. I will keep doing posts as the room progresses. Amy, what a tremendous difference! I love your choices of paint and flooring. And the pocket door is perfect for a small room! I think re-decorating a room is hard work. You did a great job and love the china white paint. It certainly is Victoria! But once I get the decorating part, it's fun!